I'm hoping for a fruitful year. 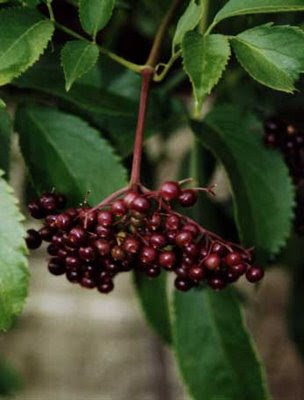 I just bought 2 elderberry bushes from Burnt Ridge Nursery in Washington state. We have elderberries growing wild around our prairie farm, but none are safe from pesticides. There is one growing in the wind break north of the machine shed, but it's young yet. I'm watching it and hoping for berries soon. These new bushes will go in back of the house along the pasture fence where no-one sprays. We've planted pears, crab apples, blueberries and rhubarb in the last few years. This year I'm going to get strawberries and hopefully find my strawberry pyramid. I think that will work better than a regular bed. I'm lax at thinning out the new plants when they set out runners. I'd also like to get some apple trees started. Those are the fruits we like the best. Well, peaches too, but they are hard to grow in Nebraska. We seem to get a late killing frost most years. I'd like to try the pecan variety that has been in development in Nebraska but not sure where I can get those trees. I'm wondering if I plant my zucchini in a Topsy-Turvy grower, would keep the squash borers out of them? I never seem to get many zucchini because of those danged bugs. Farmer-dear wants radishes and I'm intrigued by Daikon radishes. They have a great root, and we can eat the seed pods too. Onions/scallions, I saw Wandering Onions along the roadside up by a neighbor's house last spring. I need to be watching for those again, so I can dig some up. Lettuce mix, spinach, Swiss chard, winter squash are all on the list too. I'm anxious to see how my blueberries fared and if Farmer-dear damaged the rhubarb when he moved the manure off the potato bed. Which reminds me to get some of that strawy-manure on the asparagus patch before they start poking up. Basil, but the regular kind. I was not impressed with the variety pack I got last year. I like the common basil that makes great pesto and dried down well. More thyme as well as some Mother-of-thyme, ground cover for around the stepping stones to the clothes line. Cilantro seed to plant every 2-4 weeks all season. And I won't even begin on the flower bed ideas I have. Can you tell I have just a touch of Spring Fever?? Oh how I wish I had a green thumb and space to plant. Have fun with your garden. oh yes, I love your background imagery. Sewnut: Me too & snow this evening/night. 3-5"
Sweet P: You can do container gardening. Try it this year. Just a tomato or cucumber in a big pot. Prairierunner: I get tomatoes that way! Rarely zucchini.